A Russian spacecraft heading to the International Space Station (ISS) has blasted off from Baikonur, Kazakhstan. The Soyuz rocket propelled Malaysia's first astronaut into space alongside the first female astronaut to become commander of the space station. 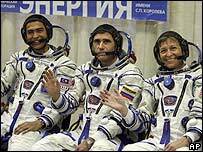 Sheikh Muszaphar Shukor and American Peggy Whitson were accompanied by Russian cosmonaut Yuri Malenchenko. Ms Whitson and Mr Malenchenko will remain on the ISS for six months, replacing two other astronauts. Mr Shukor will spend nine days on the space station before returning to Earth with the outgoing crew. The Soyuz-FG rocket was launched on schedule at 1752 Moscow time (1322 GMT), topped with a spacecraft containing the three crew members. Reports said the rocket was adorned with a Malaysian flag as it lifted off. The launch has been eagerly anticipated in Malaysia, where it has been hailed as a landmark for the Asian nation. Prime Minister Abdullah Ahmad Badawi joined 1,000 schoolchildren at a ceremony in Kuala Lumpur to mark Malaysia's entry into space. They clapped and cheered as a giant TV screen showed scenes of Sheikh Muszaphar smiling inside the spacecraft minutes after the lift-off, the Associated Press reported. Mr Shukor will be the first Muslim to fly in space during the holy month of Ramadan and will be there for the Eid festival, when he will treat his crewmates to a celebratory meal. For the rest of the time he will try and observe the dawn-to-dusk fasting rules of Ramadan. Muslim clerics in Malaysia have prepared special guidelines for him on observing religious rules while on the ISS. He will use a wet towel rather than water to clean himself before praying, and is not obliged to kneel in zero gravity or face Mecca while praying. To avoid confusion about when to pray, Mr Shukor will follow the time at the launch site in Kazakhstan. The crew are expected to dock at the space station on Friday.